The founder of Aikido Morihei Ueshiba (also known as O Sensei and henceforth referred to as such) developed his art over the course of a long life of training and experience and consequently went through many phases in it’s development and maturation. 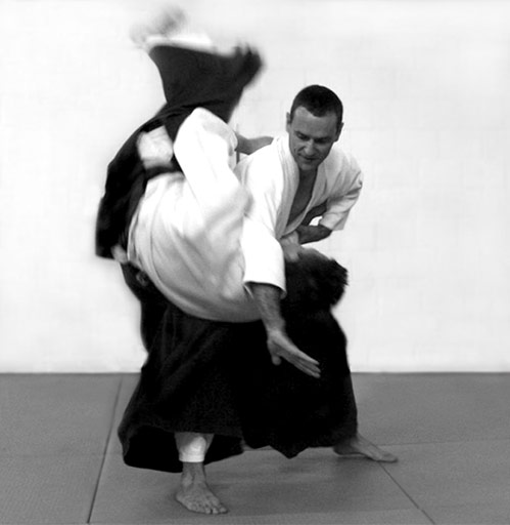 Today we see a plethora of different schools of Aikido all over the world, from the very ‘hard’ physically oriented styles with a greater combat emphasis to the more ‘soft’, health and exercise oriented approaches. This reflects the many students that O Sensei had at different times during the development of his art who then went off to establish their own schools with their own philosophical interpretations and distinct didactical approaches. Furthermore, no tradition stands still in its development and Aikido continues to evolve and change, particularly as it spreads out vigorously beyond its native and cultural origins around the world. This variety of interpretation and expression while at the same time confusing for the beginner is part of the rich legacy and potential of the art. The style or line of Aikido that is taught in this Dojo is known as Takemusu Aikido and is a traditional form of Aikido that was passed on from O Sensei to the late Morihiro Saito Sensei (1928 – 2002). He was a personal disciple of O Sensei for over 23 years and took over his Dojo in Iwama Japan after his death, considering it his duty to preserve and pass on the Founder’s original source techniques in as pure a form as possible. RIAI: The integration of empty handed practice (Taijutsu) and practice with weapon (Bukiwaza) whereby both practices are understood as one integrated and mutually reinforcing whole. KIHON. Strong emphasis on basic training (Kihon) with a clear distinction between basic and more advanced levels of practice and technique. It is understood that the all the fundamental elements of the art are ‘encoded’ in the most basic techniques and that ability in advanced technique depends on the depth of one’s grasp of the basics. BUDO Aikido understood and practiced as a modern yet traditionally rooted martial art with relevance to daily life in all it’s aspects beyond the regular training in the Dojo.